How Long Is An Ebola Victim's Body Contagious? You Don't Want To Know : Goats and Soda New research confirms that even after a victim dies, viral cells on the corpse can infect others for as long as 7 days. 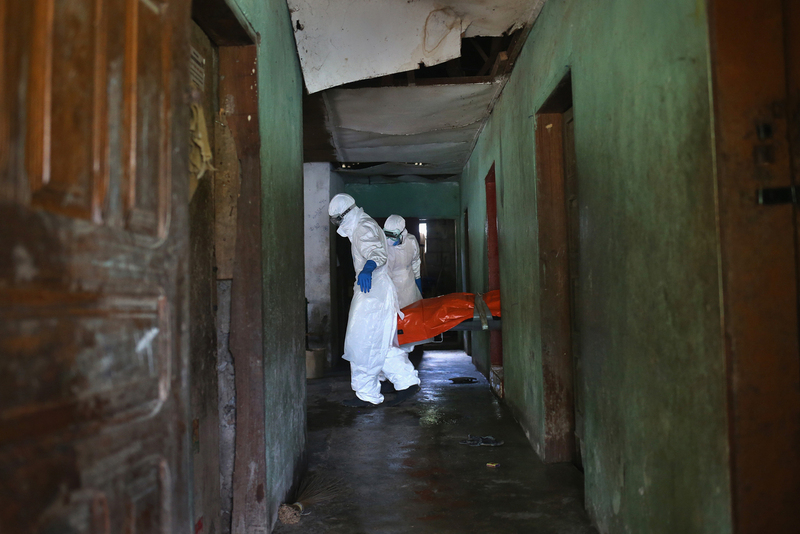 The protective gear worn by Ebola burial teams is critical: A corpse can be contagious for up to 7 days. These workers are carrying the body of a woman who died of the virus in her home in a suburb of Monrovia, Liberia. People in West Africa often touch and wash the dead in their community. That's a problem when it comes to handling Ebola victims. Their bodies are known to be contagious. And so Red Cross body collectors receive careful training and protective gear before they embark, but it's tough to alter this tradition. Now researchers have confirmed how long those bodies can be contagious. The Ebola virus can survive for up to a week in a dead primate. "As long as the virus is viable then there shouldn't be any difference between a live body and a dead body," head researcher Vincent Munster, a virus ecologist at the National Institute of Health, tells Goats and Soda. His findings will be published in May in the journal Emerging Infectious Diseases. Ebola isn't the only virus that can linger after death. "Just because a body dies, it doesn't mean that all cells die simultaneously," says Alan Schmaljohn, a microbiology and immunology professor at the University of Maryland, who is unaffiliated with the study. Viruses continue to reproduce, although the total number of viral cells decreases exponentially as the body decays. Of all the viruses that stick around, the most persistent is smallpox. "It can last for an exceedingly long time," Schmaljohn says, describing how the virus remains viable in scabs. "That's part of what makes the smallpox vaccine such a good vaccine," he says. Because the virus is so tough to kill, doctors could easily move the vaccine from place to place without refrigeration. But it'd be tough for a smallpox scab to harm another person. Schmaljohn says that a person would have to grind up the scab and apply it to broken skin before the virus would pose a risk. So exhuming a corpse from a 1910 victim "would not be hazardous," says Schmaljohn. A respiratory illness like influenza also isn't such a concern, because the dead aren't likely to sneeze on you. Still, a living person who touches influenza-infected mucus, even from a dead person, might get sick. As for Ebola, it can spread through many different channels. So it's really easy to catch from people living and dead. "When somebody succumbs to the Ebola virus, the virus is everywhere [on that person's body]," says Munster. "Anywhere you would take a swab you will find the virus." The decaying body emits fluids — blood, saliva, pus, feces — and all of them could carry the Ebola virus. So if any of those fluids come into contact with an orifice or an open cut on a living person, there's a decent chance that person will get infected. And that's the case for at least one other disease that seems far less exotic: norovirus or stomach flu.